3. Writing in a clear and accessible style. It’s in the final two chapters, however, that Baker moves beyond the simple mechanics of parameters and gets into the philosophical “stuff,” and gets into the most interesting part of the book. He first tackles a schema for ordering his “elements”: “…parameters are ranked by their power to affect one another and their potentials for rendering each other irrelevant.” (p. 162) Using this criterion, “polysynthesis” become the first parameter – the “hydrogen” of the parametric table of languages. 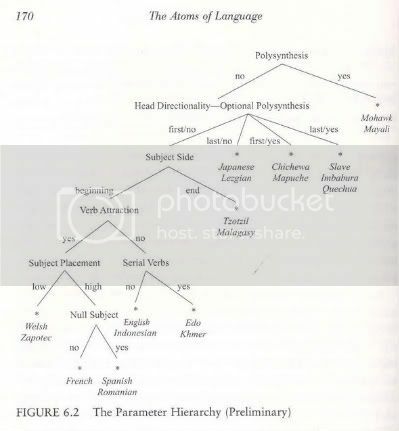 Whether a language opts to be polysynthetic (like Mohawk) or not (like English) determines how the remaining parameters interact, e.g., head directionality is prior to the subject side parameter, which is prior to verb attraction, etc. Baker commendably avoids over-determining language development. First, he’s offering only a preliminary suggestion of how a schema might be organized. And second, humans are not atoms subject to (relatively) iron-clad natural laws. Identifying parameters might help linguists predict a language’s syntax but can’t determine it. An example is Hindi, an Indo-European tongue, which is head-final and ergative in the simple past tense due to the influence of neighboring, non-IE languages on the Indian subcontinent. Another example is Amharic, where the verb follows its object. The parametric table would predict that Amharic should use postpositions but it doesn’t; it uses prepositions just like English and, as with Hindi, due to its proximity to SOV languages. Why does this occur? It occurs, in Baker’s estimation, because “human speech is unbounded, stimulus-free, and appropriate” and can’t be explained in wholly mechanical terms. (p. 223) A second factor is that people (esp. children) learn languages from the people around them. Studies have shown that absent “intentionality” and “interaction” people don’t learn a new language (so my dreams of learning Spanish by watching “Sabado Gigante” are just that – dreams). A third factor, also most present in the young, is that language learners can extrapolate from examples. It may be an inaccurate conclusion (like OE-speaking children coming to believe SVO was the correct English syntax) but if it reaches a critical mass it transforms a language. This latter factor is part of our general capacity to infer patterns and generalities from imperfectly understood specifics. Baker is an acolyte of Noam Chomsky and assumes that there is a Universal Grammar lurking in the human brain. Most of my reading in linguistics has been with – if not outright anti-Chomskyans – at least authors with serious issues with UG. But I’m an agnostic on the subject; Chomsky’s insights (and those of his followers) are either going to be a part of any theory of language or their inadequacies will have to be addressed and resolved. Baker defines the two prevailing viewpoints regarding diversity and development: “cultural transmission” and “evolutionary biology.” Neither of these can wholly account for the variety of languages nor for our ability to learn a language. Cultural transmission focuses on the plasticity of human nature and puts nurture before nature but adherents can’t explain why languages are diverse within a limited frame of reference. E.g., only 1% of nonpolysynthetic languages are OVS, and there’s only one (possibly) OSV language that has been studied to any extent yet 87% of nonpolysynthetic languages are SVO or SOV. (p. 128) (The proportions aren’t exact since they don’t incorporate every language but the ratios are probably close to reality.) There’s also the problem that a culture’s grammar bears no discernable relationship to other cultural artifacts. Baker’s chief objection to evolutionary biology is that it doesn’t explain why language capacity doesn’t extend to a complete, fixed and truly universal grammar. Or why diversity confers any advantage at all. In fact, most theorists aren’t even concerned with the questions Baker wants to ask. Baker is limited to pointing out the limits of current theories since the state of knowledge is still in its infancy. The first hypothesis we can dispense with is that there’s a physical reason why parameters are in a language. There’s no evidence for this, however. Even in the face of our ignorance, nothing suggests such a necessity so Baker dismisses this option. A second theory says that parameter-based language ability (PLA) is an accident of evolution. A conceptual system similar to that of apes evolved with a parametric component and fortuitously conferred an advantage over other hominids. But Baker fiercely resists any suggestion that parameters are evolutionary spandrels. So this idea too is dismissed as inadequate. 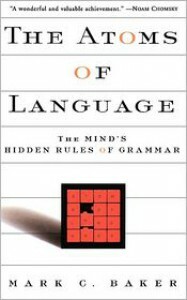 Other possibilities have been offered by Steven Pinker and Paul Bloom: “…some facets of language might have been so easy to learn with the cognitive apparatus that was already in place when a gene-based language recipe appeared on the scene that there was no pressure to specify those facets.” (p. 213) This suggestion has significant problems, however, and ends up being as inadequate as other theories but it’s headed in the right direction. A second hypothesis, also derived from Pinker, argues that a PLA makes it possible for individual speech to stay in tune with a group’s communications. Essentially, people construct language from individual recipes that would express themselves externally in a common tongue. (p. 214) Unlike many other hypotheses, this one is potentially testable but studies that touch on the question tangentially suggests that this can’t be true. Ultimately then there’s no remotely adequate explanation for why a parametric table of languages would exist. It’s here that Baker speculates most freely. He distinguishes between two types of problems: There are puzzles, which are questions that can be answered using traditional scientific theories and procedures, e.g., Fermat’s Theorem. Then there are mysteries, which are questions that appear irresolvable with current theory and practice, e.g., why would one language “opt” to be polysynthetic and another not? A mystery is a puzzle, the “difference is that those explanations happen to be outside the range of what the human mind can grasp.” (p. 228) It’s in this latter category that Baker puts PLA. For him, it’s dependent upon how the human mind relates to the external world, a subject we’re only beginning to understand and for which we have only the most primitive tools. In the end I would recommend this book to my fellow linguistics geeks. It’s given me a new perspective for looking at languages, their histories and their development. * Once again I am reminded of Olaf Stapledon’s Last and First Men and Star Maker: Two Science Fiction Novels. The First Men (us) were aware of “mysteries” but they didn’t have the brains to solve them, and it drove them insane as a species.